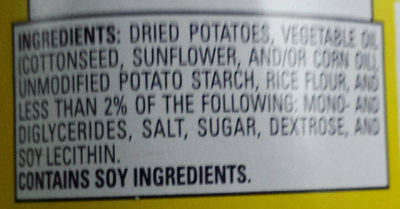 Dried potatoes, vegetable oil (cottonseed, sunflower, and/or corn oil), unmodified potato starch, rice flour, and less than 2% of the following: mono- and diglycerides, salt, sugar dextrose, and soy lecithin. Product added on June 7, 2018 at 8:59:48 PM CEST by kiliweb. Last edit of product page on October 4, 2018 at 11:44:01 PM CEST by hhm0.